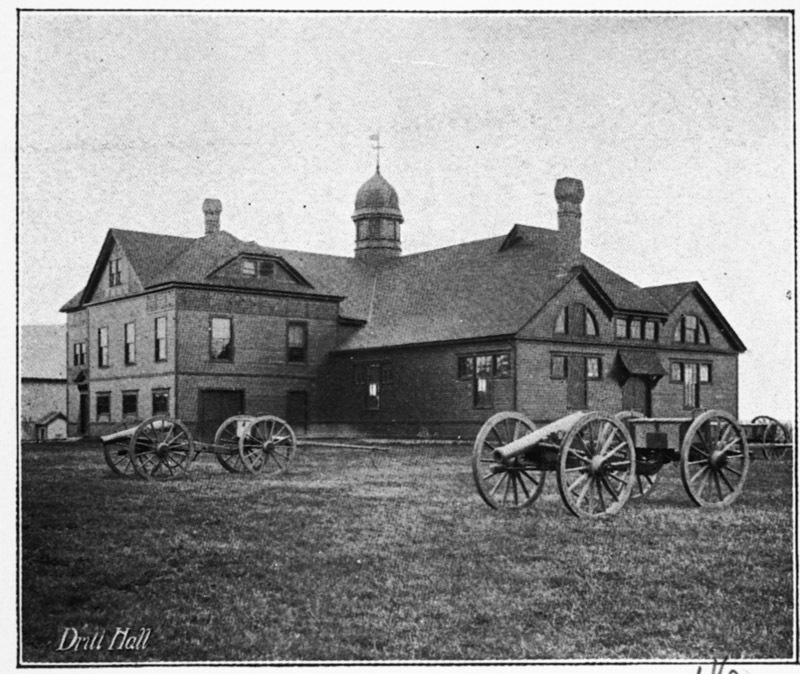 View of the drill hall with three cannons on the lawn. From Handbook of Amherst by Frederick H. Hitchcock (1894): The drill Hall was erected in 1883, at an expenditure of $6500. The Armory, at the right of the entrance, contains the arms furnished by the state to the college corps of cadets. The main hall is 123 feet long and 48 feet wide, and has an asphalt floor. It is heated by a hot-water system, introduced in 1888. This comfortable winter quarters of the corps is used by the students as a gymnasium. The second floor of the building contains the commandant's office, and a recitation room for the classes in military tactics science. A short stairway leads into the tower of the building. On the campus adjoining this building are earthworks for use in mortar practice -- a part of the regular military training of the college. Amherst the village beautiful, cultured and literary/Amherst House hotel par excellence [brochure]. Springfield, Mass. : John C. Otto, printer, n.d.
Lovell, John L., 1825-1903, “Drill Hall at Massachusetts Agricultural College,” Digital Amherst, accessed April 23, 2019, http://www.digitalamherst.org/items/show/135.